Angela Caputi - 2006 Simonetta Vespucci Awardee. AWA's Simonetta Vespucci Award honors women artists. 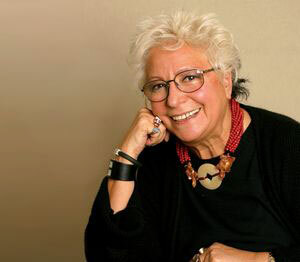 Angela Caputi, the famed jewelry designer has been recognized by the foundation. 2006 Simonetta Vespucci Awardee. Angela Caputi opened her exclusive costume jewelry shop ‘Angela Caputi Giugiù’ in Florence in 1975. It is currently located in the city’s Santo Spirito district. Today, this made-in-Italy company has become a main player in the world of high fashion. Caputi has exhibited her work in various museum venues across the world including FIT’s New York Museum (2003), the Metropolitan Museum of Art (2006) and Palazzo Pitti’s Silver Museum (2006). Her jewelry has appeared in the television series Dynasty and in various Italian films and television programs including Tu la conosci Claudia, Il pesce innamorato and Marco Risi’s Fort'apasc.